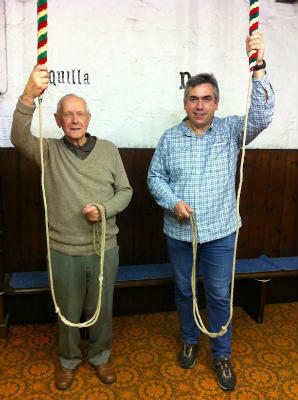 St. Andrew's band of bell ringers is affiliated to the Carlisle Diocesan Guild of Bell Ringers and further information on the bells can be found by visiting its website. We welcome anyone who may like to learn to ring, for which you can come to see what is involved at one of our Tuesday evening practices. We practice each Tuesday evening in the ringing chamber of St. Andrew's Church tower from 7.00 - 9.00 p.m.
We ring on Sunday mornings before the main service from 9.15-10.00am. In case you would like to be in touch, contact Val Bowen (Secretary) on 01768 210438, Ken Twentyman (President) on 01768 865979 or Duncan Walker (Tower Captain) on 07879 430534. On Tuesday evenings entry is normally by the South door, which is open until around 7.45 pm. In case you arrive after that time, there is also a doorbell on the West door, which you can use if the South door is locked. The earliest record of a bell in the tower is of a bell being recast in 1639, which is believed to be pre-Reformation. In 1661 there was three bells, and this was increased to five by 1704, although one is recorded as faulty, and could not be rung until 1739. In 1763 a new set of six bells were installed by Lester & Pack of Whitechapel for £332, and then in 1887, two more bells were added, and one of the old ones recast at a total of £220. Each bell in the tower is named: 1. Squilla, 2. Nola, 3. Nota (fire), 4. Signum (service), 5. Nundaie (market), 6. Noctula (curfew), 7. Morta (death) and 8. Andreas. The tower also contains a carillon, which was installed in 1915 by Messrs. Taylor of Loughborough, but which is not used now we have an active band of bell ringers.